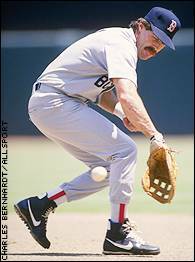 Bill Buckner has suffered more for the 1986 Red Sox loss than anyone else involved. Editor's note: This column appears in the Oct. 14 issue of ESPN The Magazine. When Bill Buckner and Mookie Wilson started signing baseball items together, I nearly threw up in my mouth. Buckner and Mookie doing the Ralph Branca-Bobby Thomson routine? How could Buckner profit from the most famous gaffe in World Series history, a blunder that shattered a region and defined a star-crossed franchise? As a reader asked, shouldn't the Son of Sam law apply here? I mentioned this heinous development in a previous column, excoriating Buckner while fantasizing about breaking one of those autographed photos over his head. Eventually, I forgot about it. But then October rolled around, and with it, another anniversary of the Clip That Won't Die: Mookie grounds to first, a creaky Buckner hobbles over, moving like a guy hopping off the crapper to answer the phone, reaches down in sections ... but not far enough. The error is now part of October, like New England foliage, Columbus Day or Michael Myers. Enduring that clip for the umpteenth time this month, it finally dawned on me: Buckner has suffered more since that moment than everyone else involved combined. Red Sox fans won't let him forget; no one does. His is a scarlet E. Buckner moved his family to Idaho a few years ago. Think that's because he likes potatoes? He was running away. You can't blame him. 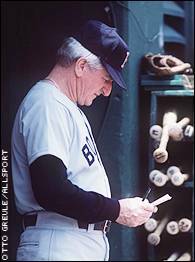 Boston's then-manager John McNamara should have known better than to send Buckner out to first in the 10th. Everyone has forgotten about Buckner's career: 22 seasons, 2,700-plus hits, .289 average, a batting title. Or how in 1986, he gutted out 153 games on ravaged ankles, knocking in 102 runs on countless clutch hits. Or how three outs from extinction in Anaheim, he started the ninth more intense than Travis Bickle, repeatedly stepping out of the box to rattle Angels starter Mike Witt. When Witt complained, Buckner unleashed a stream of obscenities-and a single to center. That was Billy Buck: heart on his sleeve, charcoal under his eyes, tobacco bursting from his cheek and always looking for an edge. When Dave Henderson belted a series-saving home run later that inning, Buckner was first out of the dugout, wrapping Hendu in a joyous bear hug. I can still see it. Today, it's assumed Billy Buck squandered the '86 Series himself. Only one problem: He didn't. Sure, a hobbled Buckner was running on fumes by the time the Series rolled around, wearing high-tops to support ankles more wobbly than a Danny Wuerffel spiral and giving way in late innings to a defensive replacement. But in Game 6, Buckner didn't send himself out in the 10th; that was manager John McNamara's decision. And Buckner didn't allow three two-out singles; that was doe-eyed closer Calvin Schiraldi. Buckner didn't unfurl a game-tying wild pitch to Wilson; that was Bob Stanley. And Buckner wasn't the one who couldn't block the pitch; that was Rich Gedman. Only after 16 pitches failed to clinch the game -- and only then -- did the cruel spotlight find him, following a lazy grounder that skipped along like a rabbit in a cornfield. Hey, I'm not excusing the error. He blew it. But even if Buckner had stopped the roller, he never could have beaten Wilson to the bag. The Mets would have had runners on first and third, with Howard Johnson coming up, the Grim Reaper on the mound, Shea rocking and the Sox reeling like Tommy Hearns to the Mets' charging Marvin Hagler. You think this team could rally from such a stunning collapse? Please. Catatonics don't regroup. Gimpy-but-game Buckner needed high-tops to support his ailing ankles. Apparently, none of this matters. 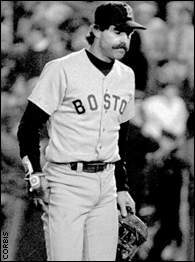 Time passes, memories fade, facts grow hazy ... and everyone believes Bill Buckner blew the World Series. Sadly, we need scapegoats, whether it's Buckner, Mitch Williams or Fred Merkle. And sadly, this isn't Hollywood, where Robin Williams could cradle Billy Buck, tell him, "It's not your fault, it's not your fault" and make everything OK. If athletes screw up on a bright enough stage, they never stop paying for it; they're convicts serving life. And since only a world championship in Boston can exonerate Buckner, the pardon may never come. Let the record show, Buckner's worst mistake was being in the wrong place at the wrong time. Let it also show the Sox wouldn't have gotten so close without him. You don't have to buy one of those signed photos of The Play, but you don't have to hope somebody breaks one over his head, either.